For him going into the Taj was his duty just as it was controlling angry rioters at Azad Maidan in August 2012. 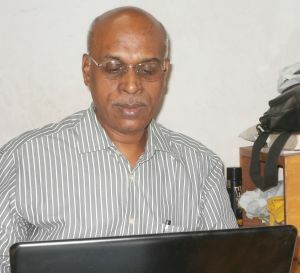 A Ganesh Nadar/Rediff.com catches up with Inspector Deepak Dhole. Six years later he sits in his quiet office in south Mumbai, smiling at the attention he gets every year at this time and promptly forgotten the rest of the time. For Inspector Deepak Dhole nothing can match the adrenaline rush of 26/11, and even though his current posting is the epicentre of agitators in Maharashtra seeking to make a point -- demonstrators need to get an okay from the Azad Maidan police station before they embark on morchas in south Mumbai -- Dhole remarks wryly, "At this police station every day is an adventure." "Every day there is an application for some protest or the other. The only thing I can do is to give them permission at different times." It was one such protest, on August 11, 2012, at Azad Maidan that spiralled out of control and saw Dhole in the thick of action once again. What originally began as a protest by a group of Muslims against the communal violence in Assam and Myanmar burst into an ugly riot following inflammatory speeches. Police permission had been sought for 15,000 people, but nearly 40,000 people turned up at the protest, which was beyond the control of the police force assembled there. The rioting, the likes of which was not seen in a long time in Mumbai, left two men dead, and 45 policemen and women injured. The protestors also desecrated the Amar Jawan memorial. "I filed the FIR (First Information Report) in this case. We arrested everyone including the one who desecrated the memorial," Dhole says in his soft voice. Six years earlier, when four terrorists entered the Taj Mahal hotel in Mumbai, on November 26, 2008, and started taking hostages and killing indiscriminately, Deputy Commissioner of Police Vishwas Nangre Patil led a group of brave policemen into the hotel to challenge the murderers. Dhole, who was then posted at the Colaba police station located close to the Taj, was among those who followed Nangre Patil into the hotel. By then the terrorists had set fire to parts of the hotel, trapping the policemen inside. Dhole, fire extinguisher in hand, led seven of his colleagues out of certain death. In the ordeal his face was badly burnt and he was out of service for six months as his wounds healed. After his posting at the high tension Azad Maidan police station Dhole was posted to a desk job, issuing gun licences. He was later put in charge of granting liquor and orchestra permits to beer bars. His son tells him to write a book about that night at the Taj, but he shrugs off the idea. "Maybe after retirement I can think of that" -- retirement is still some time away; he is only 52. Dhole feels Mumbai is more than well prepared if ever a horrific event like 26/11 recurs. "We have Quick Response Teams, modern weapons, trained commandoes all on duty 24x7," he says. "More important than all these are the public awareness campaigns we have been running continuously for years. We hold them at the police station level, in malls and other public places. If the public is alert, it is very difficult for terrorists to operate," he adds. For him going into the Taj was his duty just as it was controlling the angry rioters at Azad Maidan in 2012. Whether it is refusing gun permits or liquor licences, he does it with a sense of quiet duty. Through it all, he never raises his voice, not even when he admonishes a peon for leaving an important file on the wrong table. Images: Top: The media flees gunshots fired by terrorists inside the Taj. Exclusive! 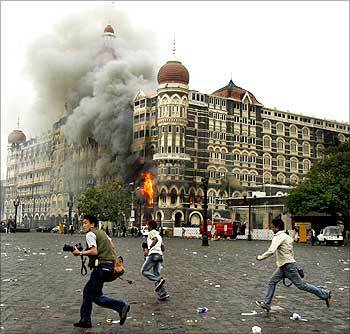 Did 26/11 terrorists live in Mumbai before attack?